The New Zealand Alpine Club (NZAC) will hold the first-ever Bouldergaine challenge on March 15 in the eminent bouldering area Castle Hill, in the Kura Tawhiti Conservation Area on the South Island. The newly invented hybrid sport is a combination of bouldering and rogaining, an endurance and navigation-based challenge that has groups of two to five participants navigating cross-country terrain in search of electronic checkpoints. During the Bouldergaine, which will be held in a four-kilometer-square area of limestone tors, participants earn extra points by climbing boulder problems. 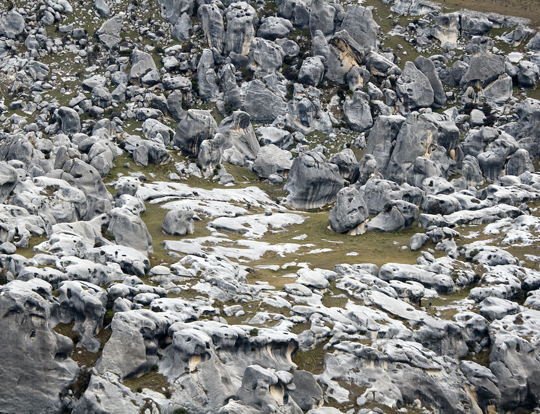 "Castle Hill Basin has been used regularly as the venue for both bouldering and rogaine events in the past, so to combine them was a natural step," said Sefton Priestley, program manager of the New Zealand Alpine Club. "Boulderers have a tendency to head to one area and project a couple of problems, and this is a great way of coaxing them to discover new parts of the boulder field. Rogainers are more used to keeping their feet on the ground so this will add a new dimension to their favorite sport. Might spook a few of them, hopefully." Priestley added that New Zealand has a devoted rogaine following with around 17 clubs that organize map-based sporting events. The first Bouldergaine will have a limited number of participants, a couple hundred, said Priestley, out of respect for other users and to recognize the importance of the Kura Tawhiti area to local iwi communities. The sport of rogaining began in the 1990s through the Melbourne University Tramping Club, which already held periodic 24-hour navigation challenges. In an effort to discourage teams from simply following the team in front of them, the rules were changed to encourage visiting checkpoints in any arrangement and order. Rod, Gail and Neil Phillips, who devised this system, used the first letters of their names to create "rogaine." "Bouldergaining is another way of interacting with the outdoors and experiencing the joy of upwards movement," said Priestley. "The New Zealand Alpine Club aims to foster climbing in all forms, not just mountaineering." The American climbing community has seen a similar expansion in its own alpine club, with the AAC's heightened focus on bouldering and sport climbing. "Climbing has evolved, and we have done our best to evolve with it," says Erik Lambert, the AAC's director of information and marketing. "We believe that boulderers, alpinists, and everyone in between all share a common bond—a passion for climbing. Every day we are reminded of how powerful this solidarity can be: climbers can and do come together to support each other and advocate for common interests."